It’s not often that Jewish, Muslim, Roman Catholic, Ukrainian Catholic and Orthodox Ukrainians from different ethnic backgrounds get together in Ukraine. But when 37 young adults joined an immersion program, The Ark, for a week in mid-July to learn about one another’s culture, religion and history, they came away with greater understanding of respect for one another. At one point when pork was served for dinner and Jewish participants could not partake, Muslim students shared their chicken dishes with them. Seminar participant Alim Umerodzha, a Crimean Tatar activist and a Muslim, said diversity should be perceived as richness and not a reason for division. “In every lecture and every conversation, I unexpectedly discover something that we have in common,” he said. Such understanding is gratifying to Msgr. John Kozar, head of the Catholic Near East Welfare Association, which supports the program hosted by the Eastern Catholic Studite monastery in Univ and is sponsored by the Ukrainian Catholic University, the Federation of Polish Organizations in Ukraine, the Polish Consulate in Lviv, the Tkuma Ukrainian Institute for Holocaust Studies and the nongovernmental organization Crimea SOS. Msgr. Kozar visited the seminar during a pastoral visit to Ukraine, talking with participants and witnessing the exchange of ideas. The stop was among several he made in the country. “Never undervalue the benefit of bringing two strangers or even two enemies together. Because the first thing that happens, they realize that they are not that much different and want the same things,” he told Catholic News Service. Msgr. Kozar’s trip included visits with chaplains, Caritas Ukraine, communities displaced by the violence in eastern Ukraine, orphanages, seminaries and the village of Zarvanytsia, one of the country’s most revered pilgrimage sites. The interfaith seminar is one of several activities confronting religious persecution and promoting interreligious tolerance in Ukraine. CNEWA and its Ukrainian partners received a $175,000 grant from the Canadian government’s Office of Religious Freedom for the program, which includes student exchanges among the regions, summer schools, panel discussions, lectures and media publications. Myroslav Marynovych, who helped establish the seminar in 2006 as a summer school for young Ukrainians, including those who are Jewish and of Polish descent, said the seminar’s goal is to help students not only understand the past but understand and feel the pain rooted in ethnic and religious misunderstanding. In 2014, after the Russian annexation of Crimea, seminar planners decided to accept Crimean Tatars, who are Muslim. The seminar also allows participants to reflect on the challenges posed by the ongoing clashes between Ukrainian armed forces and Russian-backed separatists in eastern Ukraine. Seminar organizers specifically chose the Studite monastery to host the program. During World War II the monastery, with the help and encouragement of the Ukrainian Catholic Metropolitan Andrey Sheptytsky, hid and saved more than 100 Jewish children from the Nazis. Igor Shchupak, director of Tkuma Ukrainian Institute for Holocaust, said the monastery is a holy place not only for Ukrainian Catholics but also for Jews and Poles. Vlada Haidenko, a Jewish student from Kryvyi Rih, was making her first trip to Western Ukraine to participate in The Ark program. She said she was eager to deepen her knowledge of the history and culture of the region. “I learn a lot from other participants but also I’m very glad to share with others about our culture,” she said. The participants learned about Kashrut, Jewish dietary laws, and participated in Shabat celebrations.In 2014, the seminar met during Ramadan, and many students were able to learn about Muslim fasting and other traditions. Kiril Alfeyev, another Jewish student from the same town, said staying at the Studite monastery and seeing its many crosses, Christian icons, and statues seemed a bit strange at first, but that he became accustomed to the symbols of Christianity. “It’s interesting to talk to other people, what their values, goals, and priorities are. We all live in one country and need to understand each other better,” he said. It’s that search for unity that is important to Shandrak, the young Pole from Lviv. “Differences are interesting but finding the common ‘spine or rod’ is more important,” she said. Resilient best describes the Syriac Orthodox Church. Persecuted by Byzantines, murdered by Mongols, massacred by Ottoman Turks and caught in the Kurdish-Turkish crossfire, Syriac Orthodox Christians have managed to endure, preserving their legacy while enriching the entire church. The Syriac Orthodox Church shares in the heritage of ancient Antioch, the commercial, cultural and political center of Rome’s eastern Mediterranean province of Syria. Founded by St. Peter and nurtured by St. Paul, the church in Antioch emerged as the center of the church of the East, stretching beyond the borders of the Christian Roman (or Byzantine) Empire. The development of the church of Antioch coincided with the confluence of cultures in the eastern Mediterranean world. Debates raged as Antioch’s Christians explored the nature of Jesus, which prompted councils, the decrees of which drove a wedge between Antioch’s Syriac-speaking Christians and Greek-speaking Christians allied with Byzantium. Syriac Christians generally welcomed the Muslim Arabs invaders, who accepted them as “People of the Book.” Safe from Byzantine authorities, Syriac scholars flourished. Poets fashioned hymns that simplified complex ideas. Scholars translated Greek texts and wrote biblical commentaries. Monks explored grammar, medicine, philosophy, rhetoric and science. Theologians and poets continued the tradition of composing liturgies, borrowing elements from other Christian traditions. Drawn by this erudition, the Arabs employed Syriac scholars, who are largely responsible for the Arab world’s familiarity with ancient Greek astronomy, chemistry, mathematics and philosophy — disciplines that eventually reached Europe via Arab Sicily and Spain. At its height in the mid-14th century, the Syriac Orthodox Church stretched from the Mediterranean to Afghanistan and included 20 metropolitan sees and more than a 100 eparchies. This golden age ended violently with the invasion of the Middle East by Timur the Lame in the 15th century. Those Syriac Christians who escaped death or enslavement retreated into the mountains, huddling in fortress-like monasteries and villages. Though scholarship did not vanish completely, isolation intensified, poverty set in and generation after generation of Syriac Orthodox families abjured their Christian faith. Scholars estimate that by the beginning of the 20th century, fewer than 270,000 Syriac Orthodox Christians remained in Mesopotamia. The trials for the church have only intensified in the last 100 years, even as membership has recovered: The church now counts as many as 5 million members, although two thirds live in India. In 1915 — the “Year of the Sword” — soldiers affiliated with the Ottoman authorities murdered more than 13,000 families and 150 priests. Survivors were deported or fled, many seeking refuge in Beirut, Damascus and Mosul. Some later settled in North America’s burgeoning industrial cities. Many of the families who fled to Baghdad, Beirut and Mosul as provincial peasants are now leaving as professionals for Europe, North America and Oceania. The emigration of Syriac Christians, who once formed the core of Syria and Iraq’s middle classes, has created a regional “brain drain,” as they establish new lives far from their historic center in the cradle of civilization. The world of the Eastern churches is a complex web of history and culture. CNEWA is privileged to work for, through and with these churches, a mandate given to us when Pope Pius XI founded CNEWA in 1926. But navigating this labyrinth of patriarchs and popes, councils and creeds, can be daunting and confusing. To help clear up this confusion, we’re launching a new series that we hope will provide our readers with a better understanding of the church and its rich history. Each Tuesday and Thursday, our ONE-TO-ONE blog will feature a short overview for each of the Eastern churches. Each post will conclude with a link to a fuller account of that particular church as featured in CNEWA’s award-winning magazine, ONE. We hope you’ll find this journey enlightening and enriching, and come away with a deeper appreciation for the diversity of our shared faith. We also think you’ll come to see, in the midst of all this complexity, a clarity and continuity that truly make us one. Scattered throughout the Middle East — and increasingly, the Americas, Europe and Oceania — a Christian community continues to bear a nickname first coined by its adversaries more than 1,500 years ago. A Melkite (from the Syriac, malkaya, meaning “of the king”) once referred to a Christian who supported an emperor ruling from the city of Constantinople, now modern Istanbul; spoke Greek; lived in an urban center in the eastern Mediterranean region; and accepted the decrees of the Council of Chalcedon, promulgated in the year 451. Today, most Melkites are Arabic-speaking Christians, or descendants of Arab-speakers, who belong to a church steeped in the traditions of the Christian East yet accept full communion with the pope in Rome. They are increasingly on the move, displaced from their livelihoods in a volatile Middle East, settling in the West, especially South America, where now more than half of all Melkites live. Though Melkite Greek Catholics constitute a small church within the Catholic communion, they boldly assert their rights, privileges, prerogatives and traditions while actively seeking unity with their Orthodox kin, from whom they have been separated since the early 18th century. The Melkite Greek Catholic Church shares in the heritage of the ancient Syrian city of Antioch, now in southern Turkey. Founded by the Apostles Peter and Paul, the church of Antioch — where the followers of Jesus first earned the name “Christian” (Acts 11:26) — became the Christian hub of the eastern Mediterranean. When the leaders of the churches of Constantinople and Rome excommunicated each other in the year 1054 — the definitive rupture separating what we now call the Orthodox and Catholic churches — the Melkite patriarch of Antioch, choosing no side in the dispute, tried to reconcile the two. Eventually, the church of Antioch sided with Constantinople. When the Crusaders seized Antioch in 1098, they appointed a Latin patriarch and expelled the Melkite incumbent, who fled to Constantinople. It was during this period of exile that the original liturgical rites utilized by the Melkites and identified as “Antiochene” were replaced by the Byzantine rites of the church of Constantinople. Based in the war-weary Syrian capital of Damascus, the worldwide Melkite Greek Catholic Church is led by the vigorous Patriarch Gregory III and a synod of bishops not fearful of tackling challenging issues. “Christianity survived in the Middle East because of the married priests,” said one, Archbishop George Bakhouny of Akka in Israel. The Eastern tradition, he said, is “to choose someone who has his own work in the particular village, a good man, a faithful man, a Christian man. He will study a little bit, some theology and philosophy, and he will be ordained.” It doesn’t matter, he continued, if it is impractical to send a married man to the seminary for six years. “We don’t want all of them to be doctors or theologians,” he said, but witnesses. Priests don’t all have to be well-spoken orators; they could even be fishermen. 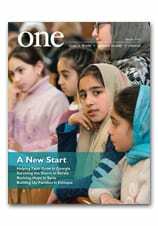 Read a full account of the Melkite Greek Catholic Church from ONE magazine here. The Rev. Sharbel Bcheiry stands outside the gate of the factory where he works as a machinist. As the city of Chicago prepares for bed, the Rev. Sharbel Iskandar Bcheiry prepares to head to work, not the work of a priest &mash; visiting the sick or administering the sacraments — but that of a laborer in a factory, earning money to feed and shelter his family. Having earned a doctorate in church history, he had originally hoped to find work at a local university. “It’s not a choice to go to work in a factory. I have to do it. If not, there is no survival — not for the community, and not for us,” he adds, gesturing to his family. So this husband and father of two travels an hour each day to work the 10 p.m. to 6 a.m. shift at one of the world’s largest suppliers of forging die steels, plastic mold steels, die casting tool steels and custom open-die forgings. He started out as a welder-fabricator working the day shift and is now a machinist. But he has not abandoned his academic pursuits; he continues to study and publish books and articles. Indeed, factory work even provides him with a distinctive view of theology. To spend a day with Father Bcheiry is to witness a life that might surprise those who imagine priests divide all their time between praying and preaching. For Father Bcheiry, that is just the beginning.